"There will be do-it-yourself kits for gardeners who will use genetic engineering to breed new varieties of roses and orchids. Also kits for lovers of pigeons and parrots and lizards and snakes to breed new varieties of pets. Breeders of dogs and cats will have their kits too. Domesticated biotechnology, once it gets into the hands of housewives and children, will give us an explosion of diversity of new living creatures, rather than the monoculture crops that the big corporations prefer." 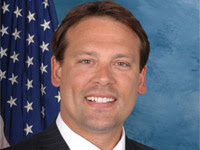 President Heath Shuler? No, another candidate has not joined this year's race. The former NFL quarterback and Democratic House freshman from North Carolina (pictured right) only makes the move to the White House in last Sunday's Washington Post Magazine as part of an extensively imagined look at what the nation's capital might be like in 2025. Metro columnist Marc Fisher outlined the scenarios with help from illustrator Peter Bollinger and "two panels of experts on everything from shopping to energy policy." Fisher also has fun describing the new Nationals Park, which by 2025 will have been abandoned to coyotes "since Major League Baseball dissolved Washington's team for the second wave of contractions to hit the sport." The online version of the Post's article includes audio excerpts from the expert panel discussions that helped Fisher concoct all of these scenarios. There's also a link to a Live Online discussion about how the story was assembled. "I would have a car that ran partially on battery power and got 45 miles per gallon -- but I would have to spend $35 to fill the tank." "We would be in the middle of a war that had already lasted longer than World War II, with no end in sight." "A woman and a black man would be duking it out for the Democratic presidential nomination." "I could carry my entire music collection in my shirt pocket." With growing demand for reliable domestic energy sources that do not produce greenhouse gases, nuclear power is looking increasingly attractive to some policy makers in Washington. Just one problem: What to do with all the spent nuclear reactor fuel for the thousands of years it will remain dangerously radioactive? Even if the Yucca facility opens sometime in the next decade, the amount of accumulated waste that's waiting to be transferred to the site may be enough to the fill the repository to its statutory limit. The U.S. nuclear power industry generates about 2,150 metric tons of spent fuel a year, and by some estimates there will be more than 60,000 metric tons needing permanent storage by 2010. Under current law, the Yucca site can only take in 70,000 metric tons, about 10 percent of which is reserved for waste from military programs. So then what? How long will it take to win approval for and build a new waste storage site? And do scientists have any better ideas up their sleeves? My "Futurist" column in the current CQ Weekly looks at some of the alternatives to geological storage of nuclear waste. The most conventional alternative -- reprocessing, or recycling, spent fuel -- might reduce the amount of waste that needs to be stored, but it won't eliminate it. Reprocessing also raises concerns about the proliferation of nuclear weapon material and know-how. More outlandish options, such as disposal in space or deep ocean trenches, were dismissed long ago. Turning some temporary storage sites at existing and decommissioned nuclear plants into more permanent repositories is one of the more viable medium-term alternatives. But that won't be a whole lot more popular than the Yucca site is to anyone who lives near those locations -- and could make it more difficult to win local support for building new plants. It also may not be safe or responsible in the long term. My conclusion: No option, short of some amazing ray gun that turns radioactive waste into Girl Scout cookies, is ideal. That's significant, given the strong political opposition to the Yucca site, led in Washington by Nevada Democrat Harry Reid, the Senate majority leader. So what do this year's presidential candidates have to say about the issue? Republican John McCain is a supporter of the Yucca site, saying it would be more dangerous to have waste "sitting all over America in pools and ponds next to nuclear power plants and other places," as it is now. Illinois Sen. Barack Obama opposes the Yucca site, too. 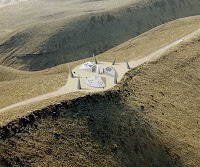 In an October 2007 letter to Reid and Senate Environment and Public Works Chairman Barbara Boxer, Obama said "the time has come for the federal government to refocus its resources on finding more viable alternatives for the storage of spent nuclear fuel." Among the possibilities he suggested are "finding another state willing to serve as a permanent national repository or creating regional storage repositories." The Yucca debate was a big issue in the Nevada Democratic caucuses, and the Las Vegas Sun included in-depth summaries of Obama and Clinton's positions on the site in its online voters guide. I also looked at questions about government support for alternative energy research in a CQ column last year. Bottom line: The nuclear waste issue is not going away any sooner than the waste itself. "We think we have solved the mystery of creation. Maybe we should patent the universe and charge everyone royalties for their existence." 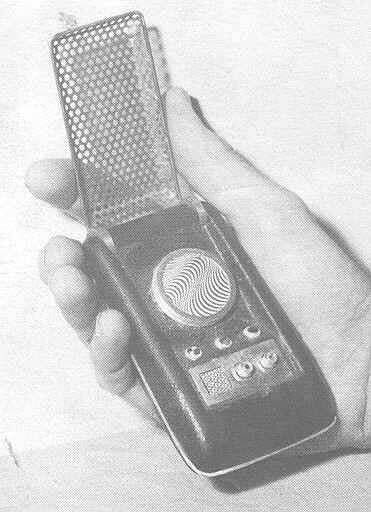 A friend recently bought me an authentic replica of a communicator used on the original Star Trek series 42 years ago. This was something we'd both wanted since we were kids. The metal shield flipped open and it chirped and beeped just like the ones on the show. One of the first things we noticed after taking this gizmo out of the box was how big it was. 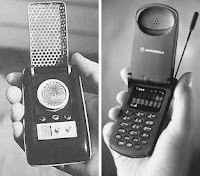 Side-by-side comparisons with similarly sized devices -- a current flip phone, a Palm Treo and a BlackBerry -- made me realize that I'd been carrying around variations of this long-coveted Captain Kirk communicator for more than a decade. The journey from NBC's Star Trek to Motorola's StarTAC (the venerable mid-'90s phone pictured far right) had only taken 30 years, not three centuries. The future has a way of overtaking imagination like that. What was fantastical fiction a few years back suddenly becomes front-page news and the subject of debate in Washington, across the country and around the world. Stem cells and cloning. Moon bases. Microchip implants. Online worlds. Satellite warfare. High-speed global data networks. Genetically altered food. Are we watching the SciFi channel or C-SPAN? This is the terrain I've been exploring for the past year in the "Futurist" columns I write for Congressional Quarterly's CQ Weekly (an assignment and column name I inherited from a far-sighted former colleague, Mike Mills, who is now editor of the Washington Business Journal). I also tread on similar subjects, though typically in a more down-to-earth and practical manner, in the technology columns and e-mail newsletters I write for Governing, a monthly magazine for officials in state and local government, also published by CQ. My observations are based on no particular expertise other than my journalistic experience and curiosity. Before coming to CQ Inc., I worked at the Washington Post and the Raleigh News & Observer and coauthored two books on the media. I have covered politics, science and technology on and off for 17 years while also working on both the editorial and business sides of print and online publishing. Media, like many industries, is feeling its way into a future that is both exciting and unsettling -- and the way technology is changing our business often provides interesting material too. In my reporting I often come across much more intriguing stuff than I can ever fit into my periodic columns and newsletters. I also find new information that adds to what I know about subjects I have already covered -- as well as facts and ideas that will take time to fuse and form full-length columns. My hope with this blog is to take you along with me on this quest for tips, trends and tools from the worlds of tomorrow. And I welcome any ideas or insights you might have for me along the way. So strap in, put on your helmet and prepare for liftoff. Next stop: the future.